I admit that I was nervous about learning how to make French macarons but once I learned how to make them, I could not stop! I immediately had to make a strawberry version because strawberry anything is a winner in my book! I love this soft and chewy strawberry macaron filled with fresh strawberry buttercream. There are a bunch of ways to get that strawberry flavor into your macarons. I’ve seen people use freeze-dried strawberries ground up into a powder, or you can use strawberry puree like I use in my strawberry cake recipe but I think the easiest and most convenient thing to use to get great strawberry flavor into your strawberry macarons is to use strawberry emulsion. 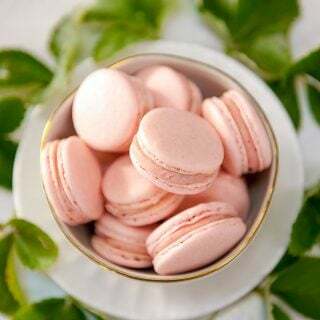 Just a tsp adds tons of strawberry flavor, a nice light pink color and it doesn’t effect the consistency of the macaron batter. 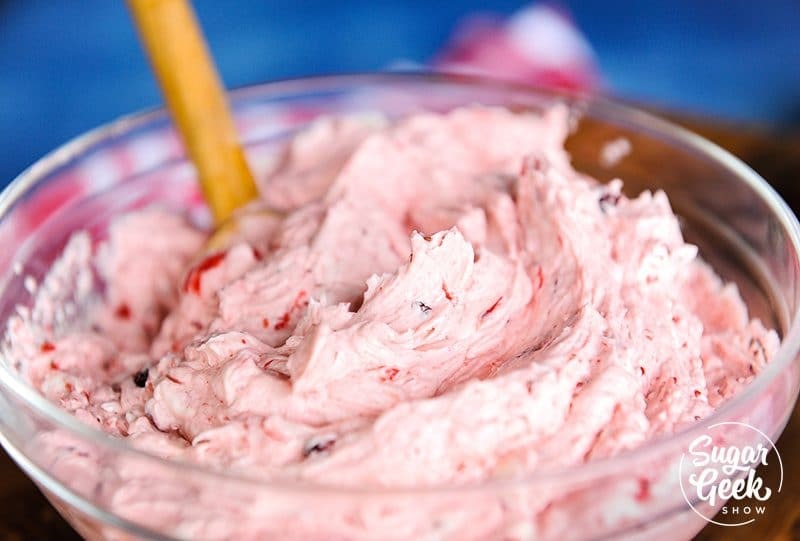 Strawberry Emulsion is basically a super concentrated flavoring made from natural ingredients. It has a very strong flavor and typically takes less to flavor your recipes than using extract alone. 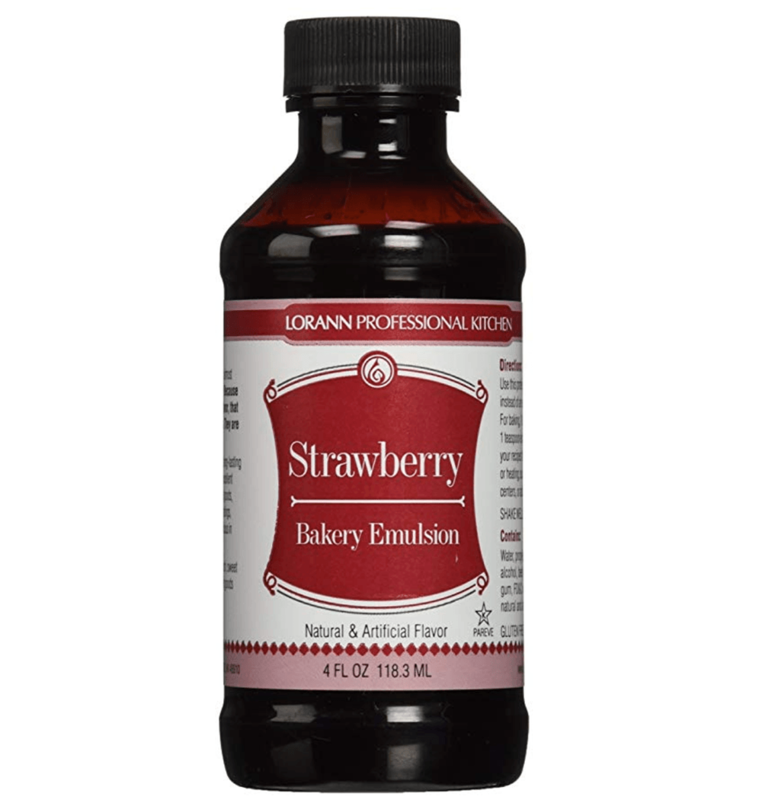 Strawberry Emulsion is great for flavoring cakes, frostings, fillings, and more. Use it in place of strawberry extract to give your baked goods a stronger flavor and richer aroma. Emulsions are the preferred choice of professional bakers for their exceptional taste and more potent flavor. 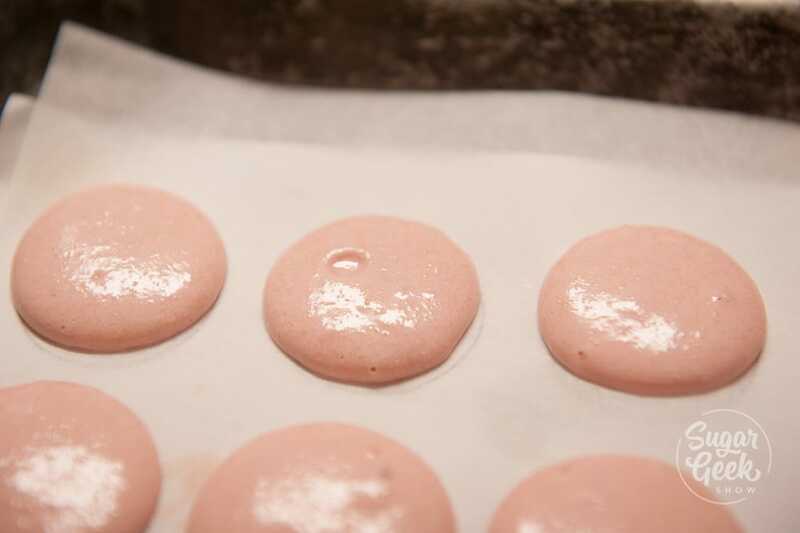 To make your strawberry macaron, we start with the basic macaron recipe. Start with room temperature egg whites, sprinkle in your granulated sugar and cream of tartar and whisk to a soft but firm glossy peak. 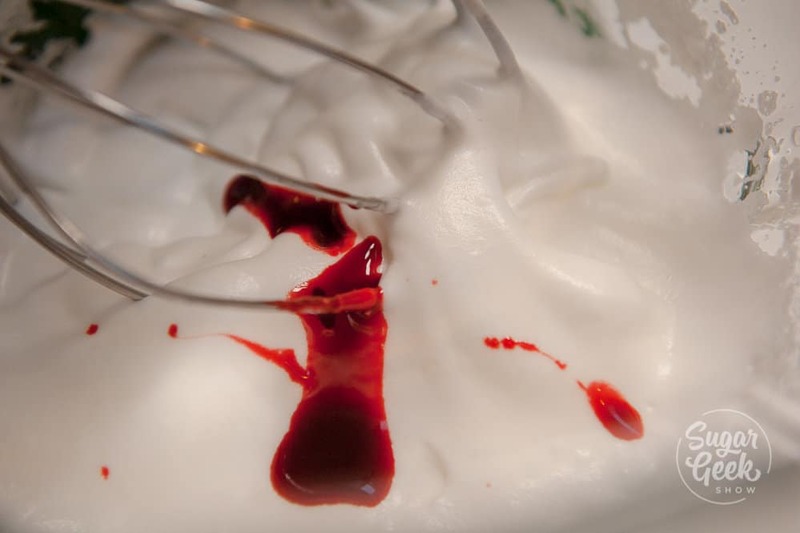 After you get your egg whites whipped to firm and glossy peaks, go ahead and add in your strawberry emulsion. You can also use strawberry extract if you don’t have emulsion but also add in a drop of pink food coloring. I used 1 tsp of strawberry emulsion… kinda looks like blood splatter in this pic. Maybe should have re-thought this one lol. Sift together your powdered sugar and almond flour. Add in 1/3 of your flour mixture to the egg whites and fold in gently. Follow my easy macaron video for more visuals on folding properly. 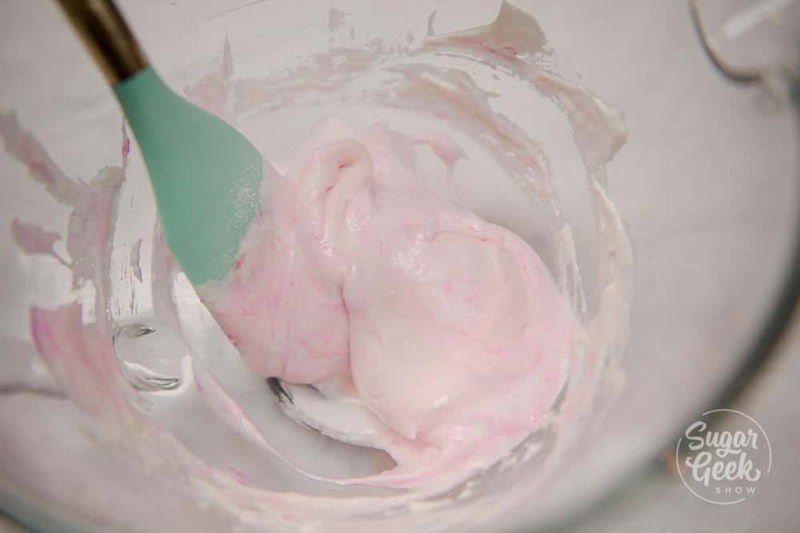 Once your mixture is cohesive, go ahead and add in the remaining dry ingredients and fold until the batter falls in ribbons from the spatula and you can draw a figure 8 with the batter without it breaking. Place your batter into a piping bag fitted with a #14 round piping tip and then pipe onto parchment paper. I use my macaron template so that all my tops are the same size. Make sure you hold your piping bag straight up and down while squeezing to ensure the cookies are all the same size and in a circle. Once you have finished piping, tap the pan a few times on the counter to pop any surface bubbles. 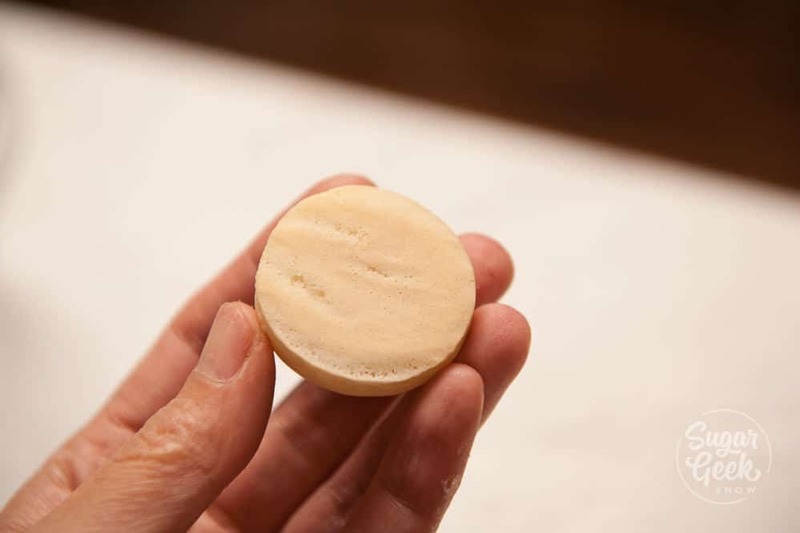 Now let your strawberry macaron cookies sit at room temperature for 30-60 minutes until a skin forms over the surface and you can touch them without feeling anything sticky. Now they are ready to bake. I bake my macarons in the oven at 300ºF for 15 minutes. The cookies should be left to cool fully before trying to peel them from the parchment paper. If they stick then they where not finished baking and you’ll have to remember to bake them for longer next time. I like to fill my strawberry macaron cookies with strawberry buttercream. 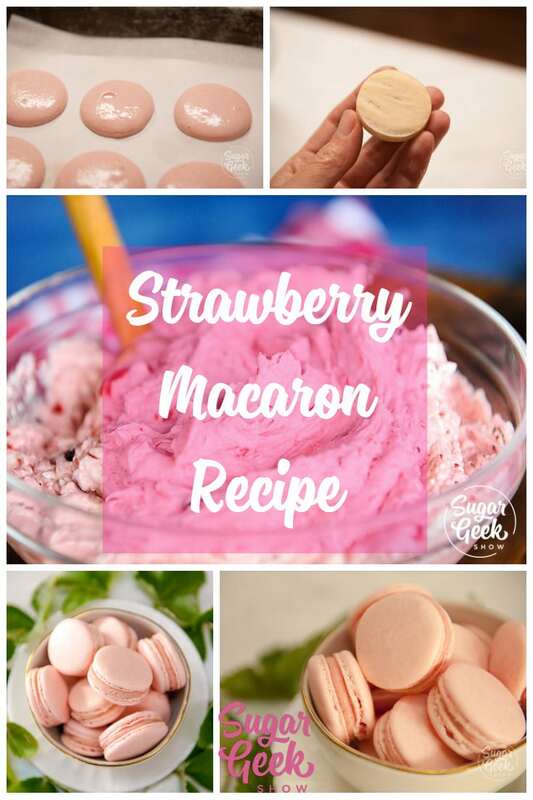 You can use fresh strawberry puree and combine it with the buttercream for a super fresh strawberry flavor but then the macarons need to be refrigerated because of the fresh fruit. Refrigeration makes macarons really hard and not great to eat so I prefer to use the Henry & Henry strawberry filling that you can buy in tubes because it does not need to be refrigerated. You can buy it online but if you have a local cake decorating shop nearby, it will probably be a lot less expensive. Just add in a little strawberry filling to your buttercream and mix. Voila! Perfect, shelf stable strawberry buttercream for your macarons. So yummy! 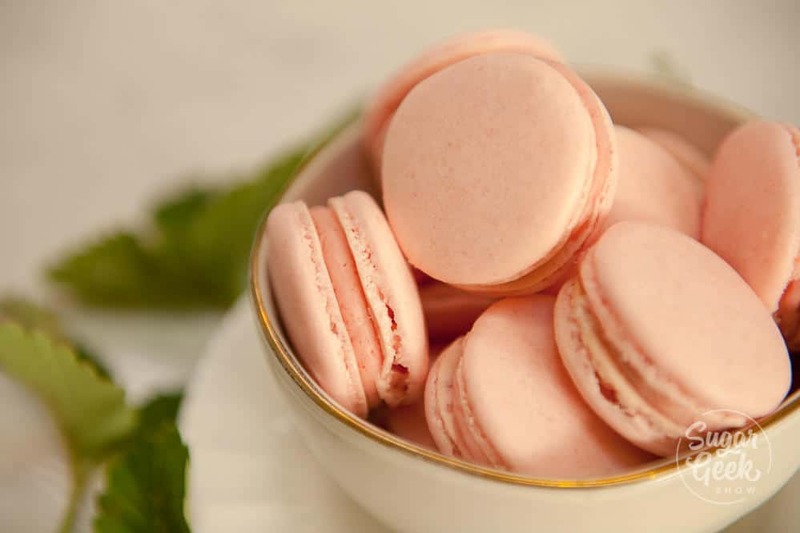 All that’s left to do is fill your strawberry macarons with buttercream and serve them up! These cookies last a few days at room temperature. You can freeze unfilled strawberry macaron cookie shells and thaw them out to use as you need them or if you’re like me, you’ll just sit there and eat them without guilt haha! These tasty little cookies never go out of style! Light and crisp on the outside, soft and chewy in the center. Color them, flavor them and fill them! Sift together the powdered sugar and almond flour, twice if not blended. 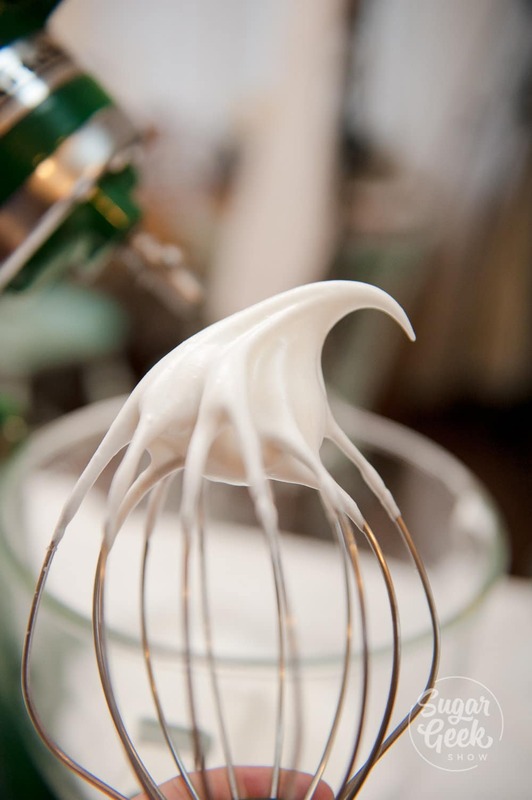 Whip the egg whites to frothy consistency and slowly add the sugar and cream of tartar, whipping until soft glossy peaks form. Add the strawberry emulsion to the meringue. Fold meringue into batter. Fold your spatula under the batter and around the edges and then cut through the center. Your meringue is ready when it forms a ribbon off the spatula and the batter that settles almost dissolves all the way back into the rest of the batter but still leave a bit of a line. Combine 1 cup buttercream with 1/4 cup strawberry puree or filling of your choice and mix until combined. Pipe buttercream in between the cookies and sandwich together. Enjoy! Great suggestions!! 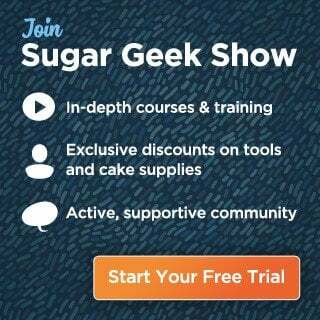 Do you know a variation for cooking times in a gas oven for macarons? I destroyed about 300 macarons last week in this thing! I’ve tried all different variations! Yikes, I don’t know for sure. I haven’t use a gas oven in my own home but I used one in pastry school. I would just start off with a very short amount of time and literally sit on the floor watching them haha. Maybe do some small batches for testing. So happy to hear about your success! I love using emulsions in my macaron recipes! Thanks for the great recipe! I’ve been scared to make macarons for so long, but I finally got the courage to try today. They turned out great! I didn’t have emulsion, so I used freeze dried strawberry powder, which gave them such a yummy color and taste! Thanks again!